Frog and Henry consider themselves a New Orleans based band, and they have fine reasons to do so. As a collective, they’ve included members from Tuba Skinny, The Hokum High Rollers, The Loose Marbles and other notables of the Crescent City busking scene. Their history and lineup are intentionally hard to pin down. Liner credits list instruments, recording locations, dates, equipment, but not bandmembers. They do give Ewan Bleach composer credit for one track on each album. Out of respect, I won’t name anyone else here. Those gap years explains how they can sound so established after bursting on the scene less than two years ago. All were involved in other great groups during those years and in other configurations with each other. They have talent in spades and use it to create understated rhythmic complexities that will please the most critical ear. Most of the titles they cover are from established jazz artists like King Oliver and Jimmy Noone but the tone often feels earlier. They are pulling on influences from pre-jazz recordings and the hokum, jug, and string acts that were also tapping those pre-jazz sources. Part of that feeling is derived from the actual tone created recording on a “Nagra iii full-track 1/4” mono reel-to-reel tape-recorder, with a single Electrovoice 664 on low impedance setting.” You can feel them crowded around the mic as if it were a horn they were playing into. They pull together their albums from multiple small sessions over the course of a year. Their two so far are both posted on Bandcamp as self-titled so I’ll refer to them as 2017 and 2018. 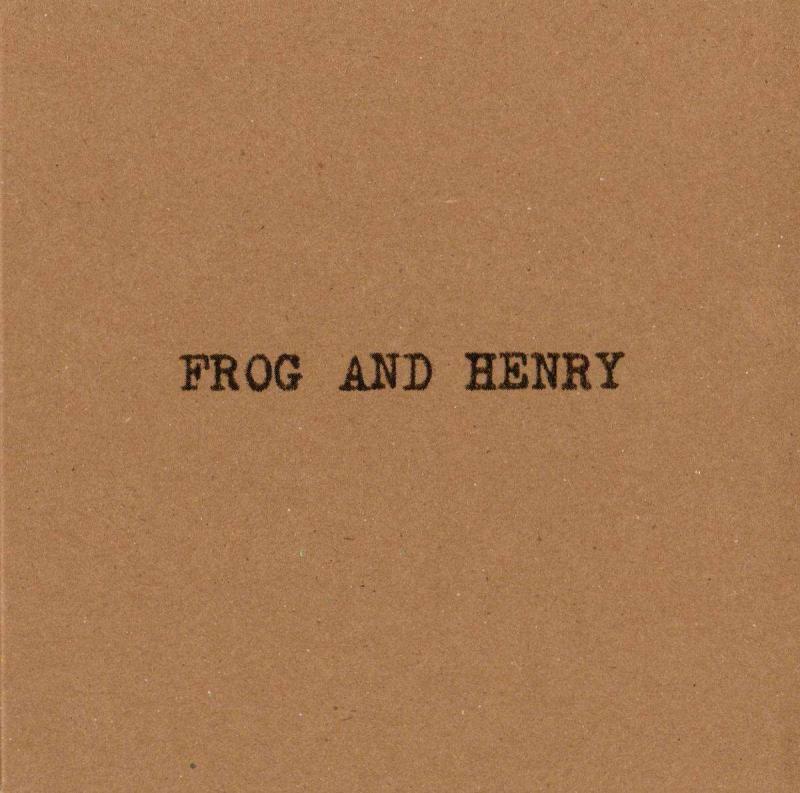 Frog and Henry by Frog and Henry The 2017 album was made in three sessions and consists of two different lineups. The album opens with a set of clarinet, alto-sax, tuba, guitar, and tenor banjo. The first track is an Ewan Bleach original, “Berlin Rags”. Bunk Johnson’s “Thriller Rag” comes next and within a chorus you’ll get what is special here. They aren’t all rags, “So Sweet” and “San” highlight the reed section’s jazz chops, as does “L & N Rag”, their arrangement of a fiddle tune. The second block of tracks uses clarinet, violin, mandolin, banjo, washboard, drum kit, baritone sax, and guitar with the addition of a tuba and second reed on the last three tracks of the album. “White Birds”, credited to Hawiaan Orchestra, “Marsovia”, a Spanish number, and “Griserie”, a composition Django Reinhardt played on banjo, are waltzes. They demonstrate the broad palette of influences bands drew from during the time period. “The Big Four” by Bobby Leecan’s Need More Band is an album highlight, with truly impressive washboard playing complementing the strings like hand and glove. Frog and Henry (2018) by Frog and Henry The 2018 album has enough instrumental variation to make your head spin but the basic lineup they vary from is clarinet, alto sax, soprano sax, tenor sax, tuba-machine, guitar, and banjo. In many cases musicians are switching instruments during the breaks. In the extreme case of “A Good Man is Hard to Find”, nine instruments are played by only four musicians, you can see the process on a Youtube video. “Cable Street” is an original composition created during the recording process and Ewan Bleach contributes a blues number. Twelve other tracks collect from a range of artists from Piron’s New Orleans Orchestra to Rudy Vallee. It is jazzier all the way to the closing tracks, “Buddy’s Habit” and “Tin Roof Blues”. It has less of the late 20’s reaching for the 1890’s, and more of the early 20’s dreaming forward. The inclusion of several vocal tracks, which weren’t a feature on 2017, add spice and a popular song feel. Their website mentions that all members are asked to contribute vocals. I can say that I didn’t hear that many voices, but the ones I heard fit the sound. I especially enjoyed “Song of the Wanderer”, and “The Object of my Affection”, both vocal numbers that really get the period voicing without a trace of exaggeration or irony. If a lot of what I said about the band seems gimmicky I encourage you to look past it and make a judgment based on the results. Despite all the restraints they put on themselves this isn’t a process group, and the end result is magic. That a group with this sound is booking shows all over the world delights me, give a listen and I’m sure you’ll be delighted to.